BirdBeat™ is the brainchild of Heather Kinch. The idea came to her quite suddenly in the middle of the night a few years ago when she woke out of a sound sleep with an idea for a birding app unlike any other. The thing is, enthusiasts have a veritable feast of fine birding apps available spanning the gamut of digital field guides, bird sighting repositories, bird song catalogs, bird listing programs, and others. Heather’s idea was to create something that would give anyone – artist or not, novice or expert, kid or adult – a quick, convenient way to capture what they see and otherwise observe about a bird, the environment it’s in, and how it’s behaving. That’s how BirdBeat™ Birder’s iField Notebook™ was born. Let’s talk for a moment about what BirdBeat™ is NOT. It’s not a field guide – although it can house a great deal of important information about your bird sightings. It’s not a game – although it is a lot of fun to use. And it’s not going to tell you where to find the birds you’re looking for – although it will help you capture all the information about those you do find. BirdBeat™ is a new tool for birders, would-be birders and everyone who wants to learn more about birds, track specific bird characteristics and behaviors, or explore a creative new way to catalog their own annual BigvYear. Essentially it’s a digital sketchbook and note-taking app that gives you a fast and organized way to record and save your personal birding observations so you’ll have them to refer to when you sit down to do your IDs. 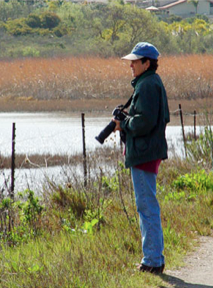 Unless you’re on a guided tour w/an experienced birder who can identify what’s being seen in the moment, most people will try to figure out what they saw hours or even days later – long after the details of their various sightings start to run together. With your iField Notebook™ it’s no longer necessary to rely on memory or unrecognizable photos. Whatever you capture about your sightings with BirdBeat™ will be right there waiting for you, ready to take you back into the moment and give you something substantive to use when referencing your digital or hardcopy field guides. If you’re unsure of your ID or just want to brag about your latest Life Bird sighting, you can share your iField Sketches right from the app via email and Facebook. 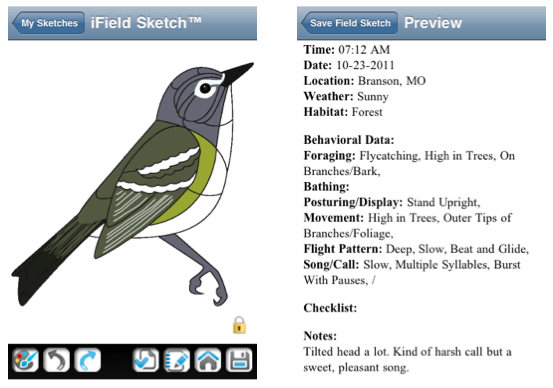 Blue-headed Vireo – a sample BirdBeat™ iField Sketch™ and data someone might record during a sighting. As with anything new and different, BirdBeat™ may take a little time to get to know, understand and feel comfortable with. And just like that crazy new kid on the block who turned into your life-long friend, the more you interact with the BirdBeat™ app, the easier it is, the faster you ‘get in the groove’, the more natural it feels, and the better a companion it becomes to you. 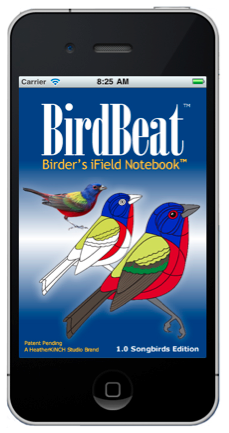 Our initial release – the Songbird Edition – is the first in an upcoming series of apps that will allow you to create iField Sketches and record data about all North American Birds. As we build our nests and forage for roots, we’ll be sure to share our newsy news, tips and tricks, funny quirks, interesting discoveries and new developments – just like any good neighbor would. Welcome to BirdBeat™. We look forward to getting to know you.